Ansonia Clock Co. Royal Bonn porcelain cased, "Chemung", ca 1901. This case is perfect with no chips or repairs. Stands 10 1/2 inches high. Decorated with cream and pink flowers all over, and gold accents. Movement is the standard Ansonia 8 day, half hour gong strike, and is running. Correct pendulum and back door. French sash with gilt cut out\'s to see the numerals, gilt dial over paper numerals. 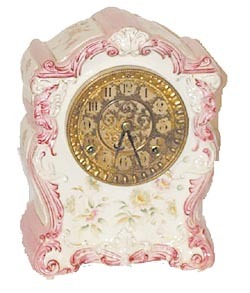 This style dial almost never seen on porcelain clocks .This model is not in the Ansonia books.